Cornell University is offering the free online course A Hands-on Introduction to Engineering Simulations beginning June 1, 2016. In this hands-on course, you’ll learn how to perform engineering simulations using a powerful tool from ANSYS, Inc. This is a problem-based course where you’ll learn by doing. Leading turbomachinery design and analysis software companies, Concepts NREC and NUMECA International, have announced a strategic partnership to offer their combined capabilities to the turbomachinery industry. Concepts NREC is well known for its Agile Engineering Design System® that includes preliminary design modules for all classes of turbomachinery. 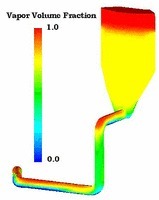 NUMECA International is globally recognized for its leadership in turbomachinery specific Computational Fluid Dynamics (CFD). CAESES has launched Happy Volute Days to promote their turbocharger & pump volute design software. Would you like to have a parametric volute model at hand, ready to use in CFD? No defeaturing, no surface healing, easily adjustable with a single click, and if you want: fully integrated with your CFD code. Tecplot, Inc., a leading provider of visual data analysis software for engineers and scientists in the aerospace and oil & gas vertical markets, today announced that it has been acquired by Vela Software, an operating group of Constellation Software, Inc. (TSX:CSU). Tecplot also announced that co-founders Don Roberts and Mike Peery, who previously served as CEO and Chairman, respectively, will retire. Tom Chan, Tecplot’s Vice President of Customer Development and a 20-year employee of the company, was named President. Advanced Design Technology (ADT), a global leader in the development of advanced turbomachinery design methods and the TURBOdesign Suite today announces that its TURBOdesign Suite version 6.1 is now shipping. This version of the company’s three-dimensional (3D) inverse design technology software provides major improvements and enhancements to the Suite. ERCOFTAC will host Lattice-Boltzmann Methods for Industrial Applications: Overview, Guidance & Examples on 13-14 June 2016 in ONERA, Paris, France.